One of the best feelings a photographer can experience is to fire up the computer and quickly find an image from the past. Knowing that you are the master of your image library builds confidence and efficiency. Catalog Collections - Controlled by the application using pre-defined filters such as All Images and Recent Imports. This is where your pictures enter the database when imported from a memory card. User Collections - Controlled by you, providing the tools to build a library structure that's consistent with your sense of organization. You can create Groups (that act like folders in Aperture), Projects, and Albums. Folders - Shows the location of your masters, whether they're in the C1 catalog container, or outside the application set up as a referenced catalog. I've published a short tutorial for organizing the User Collections area of your library. Take a look at One Way to Set Up Your Capture One Library. Following those simple techniques will help you add the structure that you crave for your image library. Later this month, my new video training titled, Capture One Pro Essential Training will be live on lynda.com. Keep your eyes peeled for my announcement. More than 100 movies that show you the easiest way to master your library, edit files, and output them in a variety of ways. The Olympus 300mm f/4 IS PRO telephoto does ship with a tripod collar. But after shooting with it for a week, I can tell you that you don't need it. Thanks to its incredible dual image stabilization system, you can handhold this super tele at shutter speeds never before dreamed of at this magnification. Supplied decoration ring can be used in place of tripod collar to maintain clean, svelte form factor for dedicated handheld shooting. Crystal in Green Dress. Olympus E-M5 Mark II with 300mm PRO, ISO 200, 1/320th, f/4.0, handheld. Photos by Derrick Story. Model is Crystal McMullen (she's on Model Mayhem). The 300mm PRO will work with all Micro Four Thirds bodies, but it is particularly well-suited for the OM-D E-M1 and E-M5 Mark II with the latest firmware. When paired with these cameras, you can take advantage of the amazing sync IS technology that provides 6 stops of stabilization. And it works. I captured sharp portraits at 1/60th handheld. The lens is remarkably light (52 ounces) for such powerful magnification at a wide aperture of f/4.0. I removed the tripod collar and used the included decoration ring for my handheld work. I did notice some compositional drift during sequences. My fault, not the lens. But it does take some practice shooting with an effective focal length of 600mms. On the left side of the barrel there's the function button, IS switch, and distant settings (to speed up focus). The ergonomics are comfortable. Focusing is very fast and accurate. I held the lens barrel in my left hand and the E-M5 Mark II in my right. I didn't experience any fatigue during hours of shooting. You can download full sized Jpegs from my Flickr photostream that will be better for evaluating the images than here in the blog. I actually pulled down the clarity for all the shots because there was too much detail in the skin. The lens handled all types of lighting very well, including strong backlight as illustrated in the portrait above. Color rendition, sharpness, and background softness are excellent with this optic. The Olympus 300mm f/4 IS PRO telephoto lists for $2,499, and I think that's a superb value. Its professional build, ergonomics, performance, image quality, and outstanding image stabilization technology rivals DSLR competitors that cost considerably more. And to be honest, I don't think you'll find this level of image stabilization on any lens at any price. Highly recommended. This is The Digital Story Podcast #519, Feb. 16, 2016. Today's theme is "Just 5 Frames." I'm Derrick Story. One of the interesting things that's emerged from The Film Project is the idea of shooting fewer pictures for any given subject. For a roll of 36 exposures, for example, I usually like to have 7 different topics. So I've been limiting myself to 5 frames at a time. I decided to move this concept over to digital too, and it's interesting the effect it's having on my photography. And that's the topic for today's show. When I get a roll of film back from the lab, one of the things I'm looking for is variety. What I don't want to see is an entire contact shoot of variations of the same subject. 35 frames of the same subject is something that I can easily do with my digital camera. And I don't think I always shot that way. So, over the last few weeks, I've decided that for some of my subjects, I'll limit myself to 5 frames. Obviously this won't work for everything. But quite honestly, I sometimes just take too many pictures. I explore this idea in today's top story. If the stealth-black GR II isn't quite showy enough for you, then you may be interested in Ricoh's new 'Silver Edition' camera, which it created to celebrate its 80th anniversary. In addition to its new color, Ricoh has also diamond-engraved the lens' specs onto its front ring, added a custom on/off 'termination' screen and bundled a leather carrying case. Only 3200 of the Silver Edition GR II cameras will be sold worldwide, so get your order in soon. The compact GR II features a 16MP APS-C-size CMOS sensor, 28mm equivalent F2.8 lens, 1080/30p video and Wi-Fi with NFC. The GR II Silver Edition is priced at $699. I often switch my white balance setting to Tungsten for urban night photography to help offset the overly warm city lights. I can do this during capture, or play with the white balance during post. By doing so, I've discovered some wonderful shades of blue that look great and feel more appropriate for these subjects. In regard to last week's Facebook Post: "Going from Lightroom or Aperture to Capture One Pro" we had some terrific comments that I want to share it with you now. Michael wrote: "This podcast is (once again!) a model of clarity on a complex topic, thanks Derrick! It's hard to imagine how you could have done more to facilitate the transition for Aperture users.Do you have any thoughts on the stability or longevity of Capture One or its owner Phase One? While making predictions is dangerous (especially about the future, as Oscar Wilde warned us), it seems worth considering this before making the significant investment of time and energy that this transition will require. Keep up the great work." And Mac added: "Another great show. I switched to Capture One in december. Since I usually run annual catalogues in Lightroom, it was easy. Just setup a new catalogue in Capture One, and done. The info you provided about importing old libraries to C1 is invaluable. Since I started with C1, it's a learning adventure. It works a little different than LR, which I had since v1. So I stumble through it. I can't wait for your Lynda.com course on it!!!" And then I had to add this fun tweet from E74 Photo: "When is your Capture 1 course coming out? Assuming installer doesn't delete root folders..."
I'm testing the Olympus 300mm f/4 PRO lens this week, and I have to tell you, this thing is insane. It uses both optical image stabilization and sensor based at the same time. I shot a series of couples portraits at 1/60th outside, and they are sharp. The equivalent of 600mms at 1/60th. Think about it! More to report next week. Gemini, the Duplicate Finder by MacPaw - Gemini's simple, fast, and safe to use, so make sure you give it a try. It's available at macpaw.com/gemini. And finally, be sure to visit our friends at Red River Paper for all of your inkjet supply needs. And a big thanks ImageFramer for also supporting this podcast. Is Your Camera and Lens Firmware Up to Date? First, I had to download the latest version of OLYMPUS Digital Camera Updater (V 1.2.1). Then connect my camera and follow the prompts. The updating instructions are here; I recommend reading them first. Everything went smoothly. So since I had the updating set-up ready to go, I thought I would check my other cameras and lenses. To my surprise, I needed to update a total of 3 cameras and 5 lenses! Wow. And there were some solid fixes and upgrades in those updates. So my question to you is... when is the last time you checked the firmware version on our mirrorless camera? You might want to brew a cup of coffee and take a look. 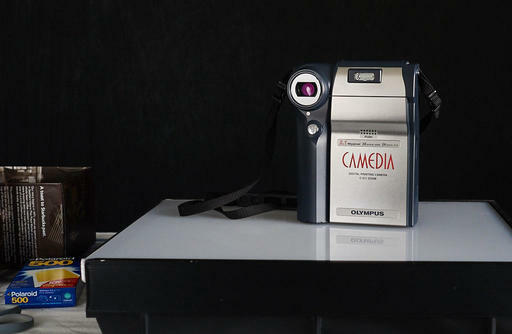 In the Summer of 2000, Olympus released one of the most intriguing digital cameras of all time: the Olympus Camedia C-211 Zoom. 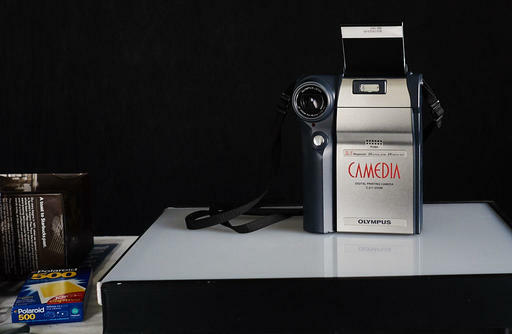 Not only did it include a 3X optical zoom, 2" LCD, and 2 megapixels of resolution, the C-211 had a built-in Polaroid printer that accepted Type 500 film. It was the best of both worlds. High quality digital files with the option to make a print at any time. When you pressed the green print button on the back of the camera, it would think for just a second, then gears would grind and a print would emerge from the top of the camera. They weren't the most beautiful prints in the world, but they were cool. We don't think of cameras from this era being particularly high quality. But take a look at this image of Dibs that I recorded today in macro mode with the C-211. It's not bad. But, those awful Polaroid prints just ooze with nostalgia. And the digital images can be quite good. So, I don't think I'll be getting rid of my C-211 anytime soon. Over the last year we've been talking about photo management software and how to cope with change. One question that comes up is "can I move my existing work to a new application?" It's a good question, and I have some helpful information for Lightroom and Aperture users contemplating a transition to Capture One Pro. And that will be the top story on today's show. If you decide to try a different photo management app, or are forced to, how much of your previous library do you have to leave behind? To some degree, that depends on the amount of work that you want to invest in the project. To help you make that decision, I'm going to outline the steps in today's podcast. At this point, you can just listen and think about what I'm saying. Because if you decide to make the move, I have a free eBook for you, titled: Moving to Capture One Pro. It has dedicated sections for both Lightroom and Aperture users, and it delves into the details of this type of transition. So, for now, just sit back and listen. Then decide what's the best path for you to follow. Instagram Finally Lets You Log Into Multiple Accounts - covered by PetaPixel. If you have two or more Instagram accounts -- perhaps one for personal and one for business - Instagram has some great news for you this week: the company is finally rolling out multi-account support, which lets you log into multiple accounts in one app and quickly switch between them. This official announcement comes just weeks after some Android and iOS users began seeing the feature in their apps. There are step-by-step instructions over on the Instagram Help page. And the Petapixel page features a short video that shows how easy it is to switch between accounts. I'm guessing that you may know that I have a journal on TheNimblePhotographer.com. So I thought I'd read you an entry today to give you a feel for what goes on over there. Today's story is an awkward incident from my trip to Austin, Texas. In regard to last week's Facebook Post: "What is the Fascination with Retro>" we had some terrific comments, and I want to share one with you now. Andrew wrote: "My recent interest in film cameras probably started more from a collector stand point. I started rebutting some of my camera history mostly for nostalgic reasons. Once you get these cameras back in your hands, they feel so good you just want to use them. I don' t think I would go back though - I like what digital photography gives me. It's just like I wouldn't relinquish word-processing for a typewriter - my brain is now rewired for digital. It doesn't mean I don't enjoy the occasional analogue "holiday". In fact, I am planning to make one day a month in 2016 as an analogue only day. I don't think an interest in film is predicated on nostalgia. My son is of the "digital native" generation and he asked for a film camera for his birthday. He had been enjoying using OM lenses on his A7s and wanted the full OM experience. Out of Chicago Update - The debut of The Nimble Photographer Workshop sold out on Friday, June 24. Because there is a wait list, we've added a second workshop on Thursday June 23. I hope you can join me in Chicago this coming June. Are you using PROMO code: STORY to save 25 percent. You can apply that toward any wood print at www.inkdot.com. Inkdot.com - Specializing in wood prints and other artistic treatments of your imagery - visit www.inkdot.com. Of all the bags I've tested over the years, I've never had so many people approach me with complements as I have with the Lowepro StreetLine 140. "That looks really nice. Is it a camera bag, or did you modify it yourself?" "Where did you get that? Does it hold camera gear too?" Yes, it is a camera bag. It doesn't look like one, does it? And don't get wrong, but it certainly doesn't look like a Lowepro bag. Shouldn't it be, well, more foamy or something? It is a Lowepro bag, and after using it on assignment in Austin, it's now my favorite Lowepro. 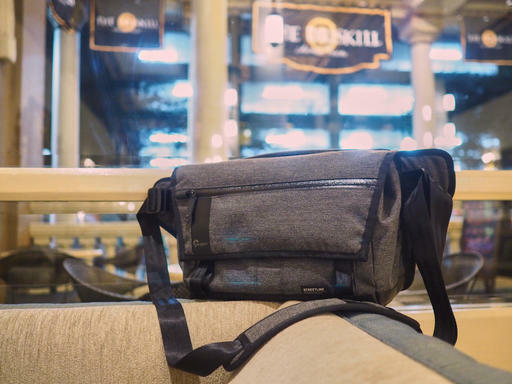 The Streetline 140 can be worn as a sling or a shoulder bag, holds two mirrorless cameras plus spare lens and personal items, plus accommodates a laptop and/or a tablet. The specs state an 11" laptop, but my MacBook Pro 13" (non-optical drive model) fits like a glove in the dedicated sleeve (that keeps your laptop separate from other items inside). In Austin, I carried an Olympus OM-D E-M5 Mark II with 14-42mm EZ zoom and the new Olympus PEN-F with a 17mm f/1.8, plus the 75mm f/1.8, 9mm body cap fisheye, iPad mini, gloves, snacks, and shades. And I still had room for extra batteries, cards, and whatnot. And here's the interesting part: the Streetline kept its slim profile and extreme comfort, even with all this gear inside. I used it mostly as a sling, keeping it secure against my back while walking, then swinging it around to work out of when shooting. It's very easy and fast to operate. There's a zippered pocket on the front flap (all external zippers are weatherproof) for quick items, another zippered storage area under the flap. Then there's the main compartment. Here's where we get to a slick Lowepro innovation. The collapsable, interior FlexPockets are super space-efficient, yet protect the cameras. So I no longer have to endure wasted storage because of foam inserts. 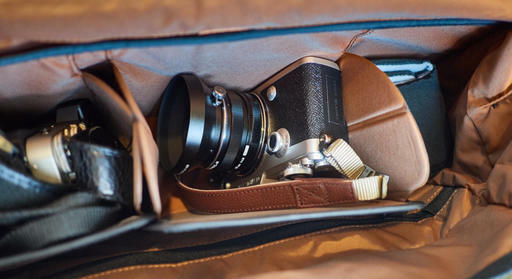 When I'm packing a camera, I pull a FlexPocket out, and when I'm just using the Streetline as a regular commuter bag, I collapse the FlexPocket to open up the entire interior of the carryall. It's clever, efficient, and works great. The strap and high-tech back panel are very comfortable, there's a handy top handle, and one of my personal favorites, a multi-function trolly sleeve. 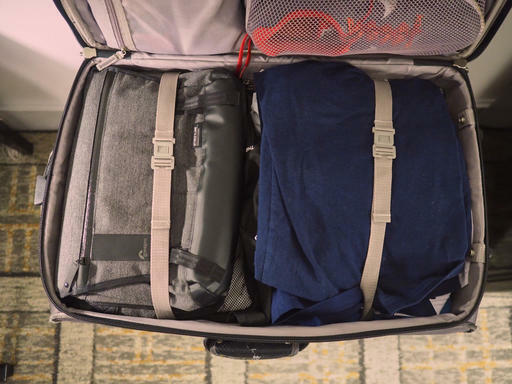 You can use it as a spare pocket when on foot, then separate the top and bottom velcro fasteners, and slide the bag over your rolling suitcase handle. Or, if you want, you can stash the Streetline 140 in your suitcase and use a bigger carryon for the flight. Thanks to the FlexPockets, the sling compresses quite flat, making it easy to stow with shirts and pants. When you arrive at your destination, load up the Streetline with your gear, and go explore. I wore the bag all day, in rain, wind, and even some sun. It maintained its handsome looks regardless of the weather conditions. My gear remained safe and dry. Most observers would never guess it's camera bag. But it is, and a darn good one. The Lowepro StreetLine 140 ($149) has a high Nimbleosity Rating. What does that mean? You can learn about Nimbleosity and more by visiting TheNimblePhotographer.com.